We are done cleaning the gutters for this season. we will resume oct 2019. 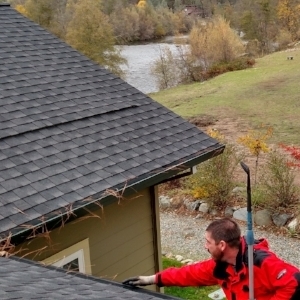 Gutter cleaning isn't rocket science, but it's also not what most people think of when they're looking for fun. 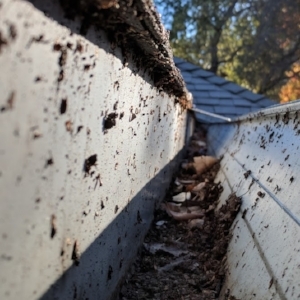 Often the first time you think about cleaning your gutters is when you see the water is not coming out the downspout like it should but is instead pouring over the top and ruining the landscaping. 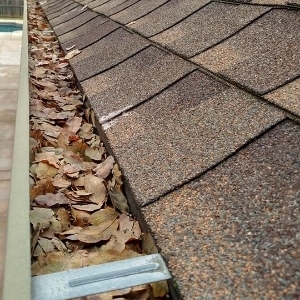 Homes have gutters to protect the foundation from the erosion that happens when water is allowed to fall directly off the roof onto the ground at the foundation, but if your gutters fill up with leaves and clog, then the water will pour over the top and/or can seep back under the roof and leak into the house. 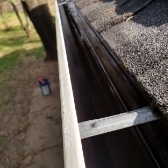 Gutters NEED to be cleaned but YOU don't have to be the one to do it. 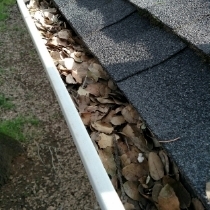 Our customers call us to clean their gutters for all kinds of reasons. "My family wants me to stay off of ladders" or "I just don't have time this year" or "I really just hate cleaning gutters" You can stay safely off the ladder and let us do the dirty work for you. We'll clear out the debris from the gutters and check the downspouts making sure that they are clear. 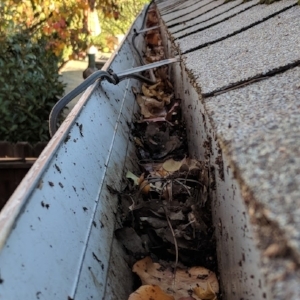 If this is how the gutters look after the other guys just used a leaf blower to blow "most" of the debris out of the gutter, we doubt they checked to make sure the downspouts are clear. Want an idea of what it would cost to have us clean your gutters? click the free estimate button below and fill out our form.